Have a theme in mind? Contact us. We can create it for you. Would you like to alter the look of this logo? Please contact us before purchasing! Custom designed Mitzvah Logos by Cutie Patootie Creations. Logos are used throughout the event from the Invitation (if you choose) all the way thru to the Event Decor, Party Favors, Sign in Boards, Stickers & Tags, Banners & Signs, Lounge Pillows, Napkins, Place Cards, Table Cards, Menus, and More. Our logo shown above can be personalized with your child's name and date. If you would like to keep these colors or change them, there is no additional charge. 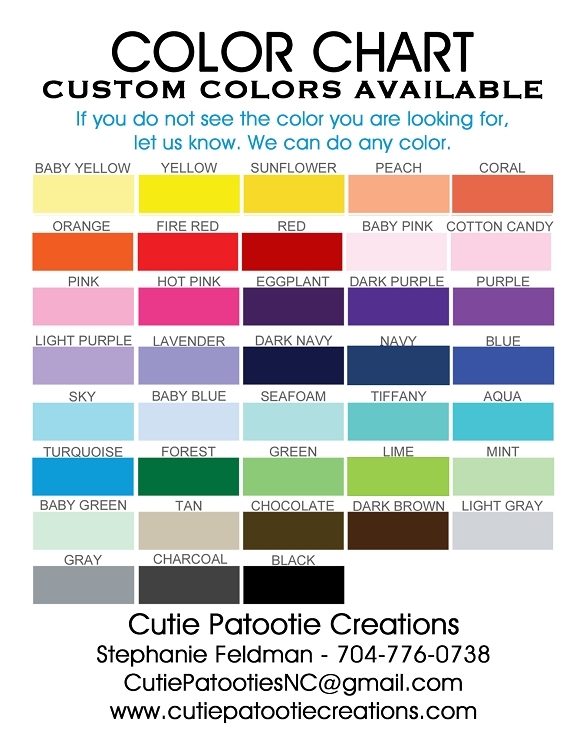 Please view our color chart above to see the color choices offered. If the color you would like is not shown, please contact us. We can do any color or color combo. If you do not see what you are looking for on our website and would like a brand new logo design created for you, please contact us to discuss. Our custom designed logos from scratch start at $150.00 depending on complexity. Add to your shopping cart and purchase. Within 2-4 business days, we will send you a digital proof of your logo. We allow 2 rounds of changes for these logos that are already pre-designed. Once you finalize your logo, we will send you your final logos in the following formats: JPEG, PNG, PDF. If another format is needed, please let us know. You may then use your logo for anything you may need for your event. You can forward this logo to all of your vendors.